32-year-old John Henry proves he isn’t done yet. Late last week, Kentucky Horse Park officials were worried that their most famous resident, 32-year-old retired racing legend John Henry, might have to be put down. But the grumpy old Thoroughbred had other ideas. John Henry, who has lived at the Kentucky Horse Park since 1985, has been suffering from kidney problems. After receiving intravenous fluids over the last several days for dehydration, the salty icon seems to have bounced back and has even felt well enough to acknowledge park visitors. 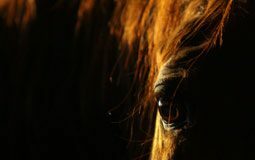 Socializing with humans has never been one of the incorrigible Thoroughbred’s greatest attributes. “We are very pleased that he’s feeling so well,” says Robin Bush, an assistant in the park’s Hall of Champions where John Henry has spent most of his last 27 years. According to reports, last Friday park officials were spray-painting corners of potential grave sites in the grass outside John Henry’s barn, just in case. John Henry rose to racing stardom during the 1980s, after first changing hands for a mere $1,100. Over his career, he won a then-record $6.6 million. He was one of only two horses at the time to win a major stakes race at age 9. He was twice Horse of the Year and won a total of seven Eclipse Awards for championships. About six years ago, John Henry survived a serious bout with colic. His caretakers are hoping that his improvement since the weekend might similarly give him more time. What a great horse and a true champion! I remember seeing John Henry at the horse park. He is an amazing horse. What nice story. So nice to see that there is a few race horses that are not slaughtered when they are no longer useful! omg well thats rly good that hes improving. when i first glanced at the pic of him i thot he was a cow!oops..! oh well hes old,he can be grumpy if he wants!